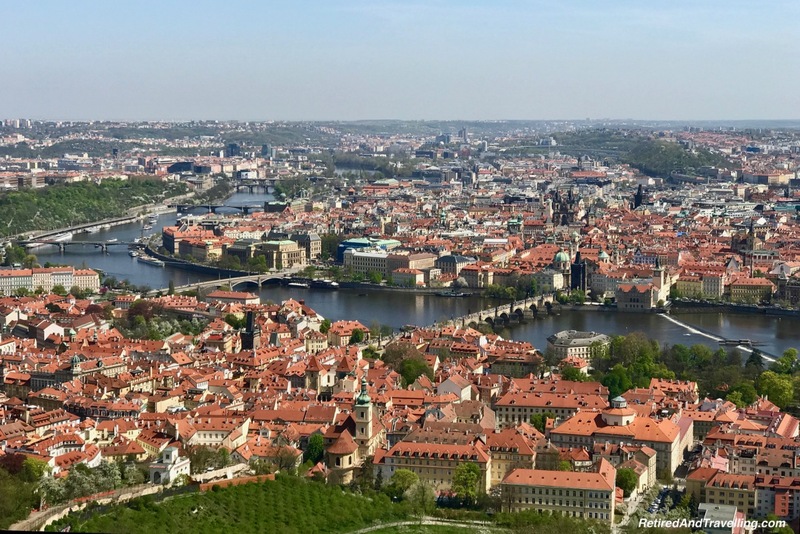 We saw the city from many perspectives when we visited Prague for 8 days. A visit to the Petrin Tower gave us a panoramic view. 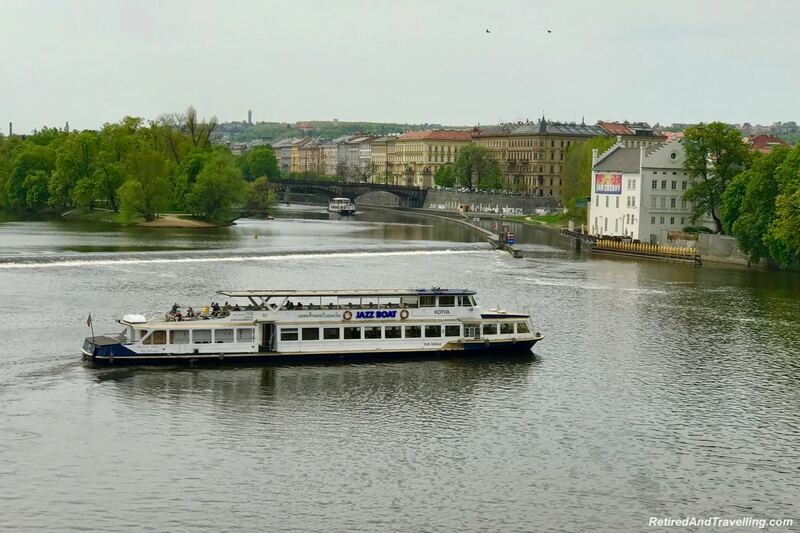 On a river cruise, we saw the sights that line the river and the canals of Prague. 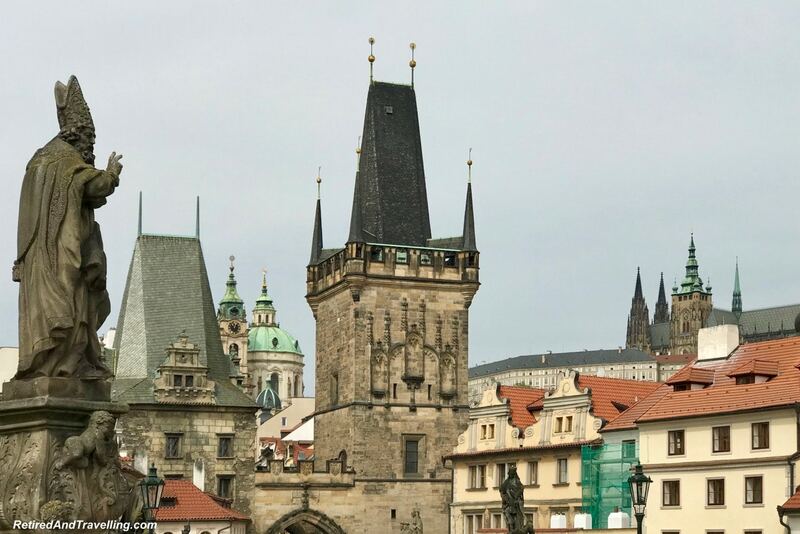 When we went to walk the Charles Bridge in Prague, we got yet another great perspective on this beautiful city that straddles the Vtlova River. 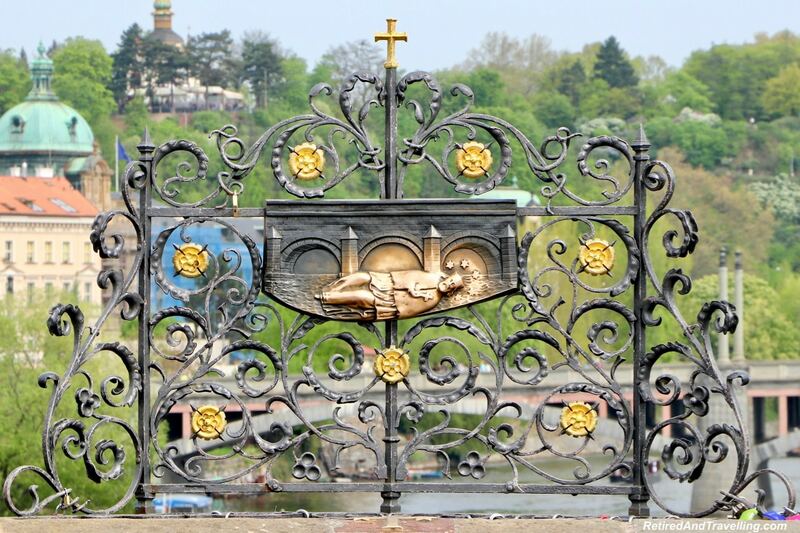 But the Charles Bridge offered so much more than just views of Prague. The bridge architecture and statues were insights into the gothic period. The artists and musicians on the bridge added a modern touch. We were so glad we got a close up view of the Charles Bridge. 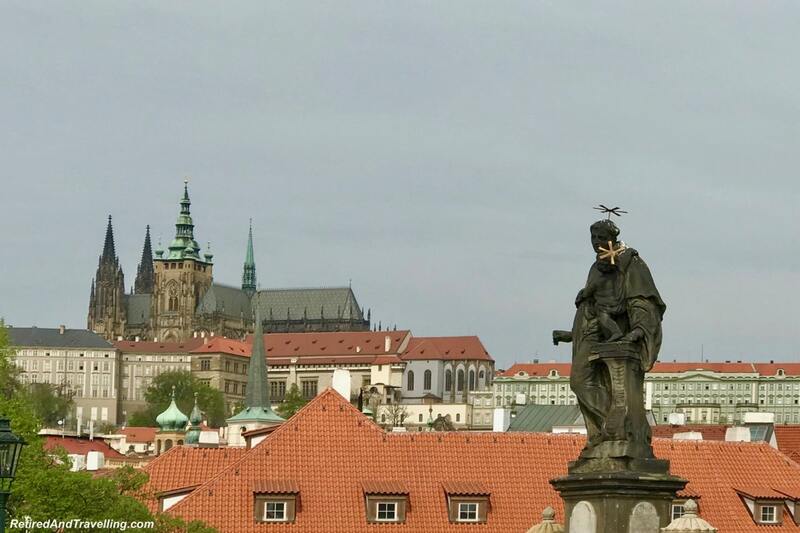 The first view of the Charles Bridge teased us when we went high in the Petrin Tower. 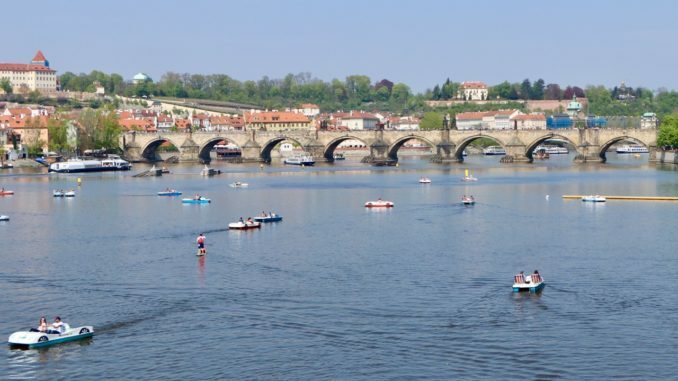 We saw 5 of the bridges that crossed the Vtlava River from the Lesser Town under the castle to the Old Town in Prague. With a great zoom lens, we could see some of the treasures that awaited us on the bridge. Walking along the riverside, we got great views of the Charles Bridge. It was the backdrop for the very busy river traffic. When we took a river cruise, we got to go under the bridge both ways. We saw the bridge ice dams put up to protect the bridge from ice flows. The Vtlava River no longer freezes so these are just relics of another time. 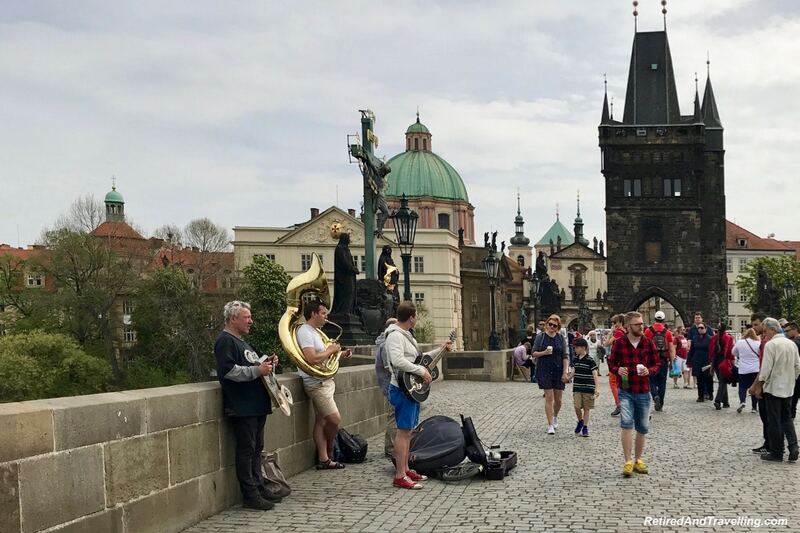 Before you walk the Charles Bridge in Prague, enjoy it from other perspectives. 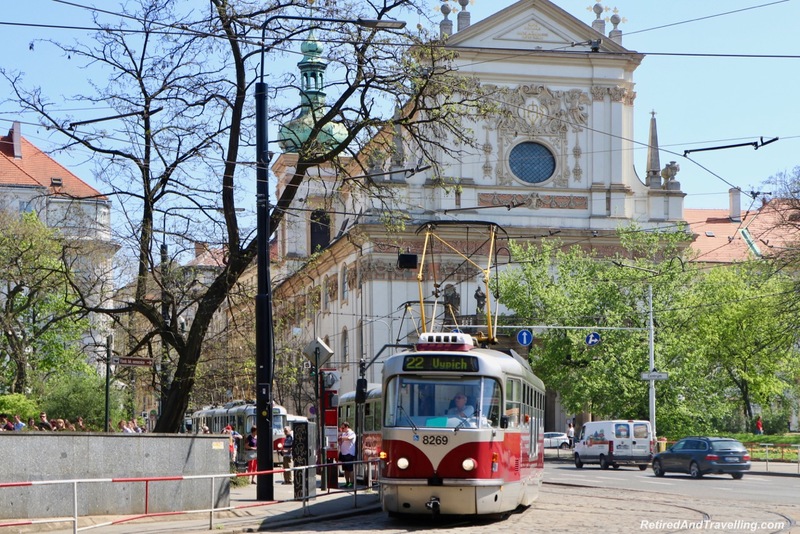 One day we took the tram to the other side and got off by the St Nicholas Church. The #22 tram stopped right by our hotel and was a great way to get to many of the tourist sights. This church was only one of many named St Nicholas (with variations on the spelling). We were amused to see the Starbucks located right at the base of the church. It was a good thing that David had a bunch of other coffee shops marked on this side of the river. 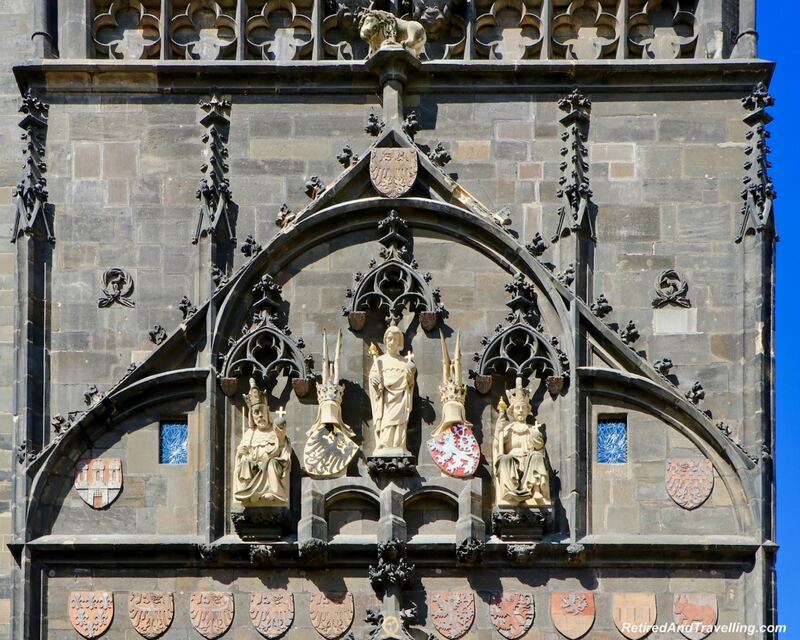 From the St Nicholas Church we walked along the cobblestone street to the Lesser Town Tower to the Charles Bridge. It was interesting to look details on this old gothic gate. We saw the first of many old cars used for tours around Prague. We were definitely in the tourist part of town. Every second shop sold tourist souvenirs. 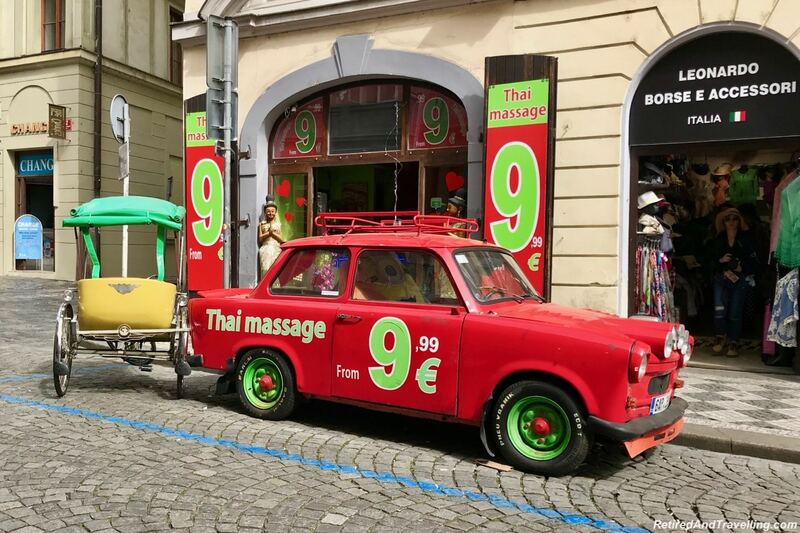 And of course we found lots of Thai Massage shops! We looked down and saw the canals we travelled on our canal boat tour. We started our walk on the Charles Bridge in Prague on the Lesser Town side. The tower hid the bridge until we walked under the tower arch. 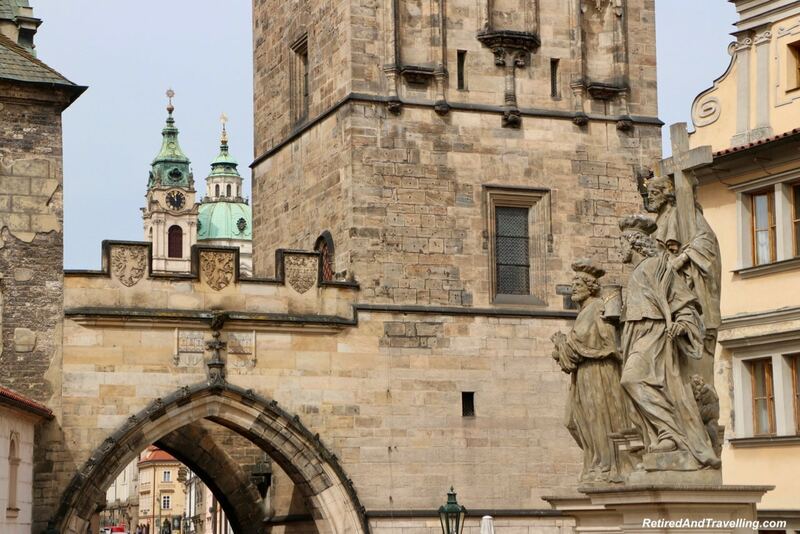 The Charles Bridge is the major tourist bridge in Prague. 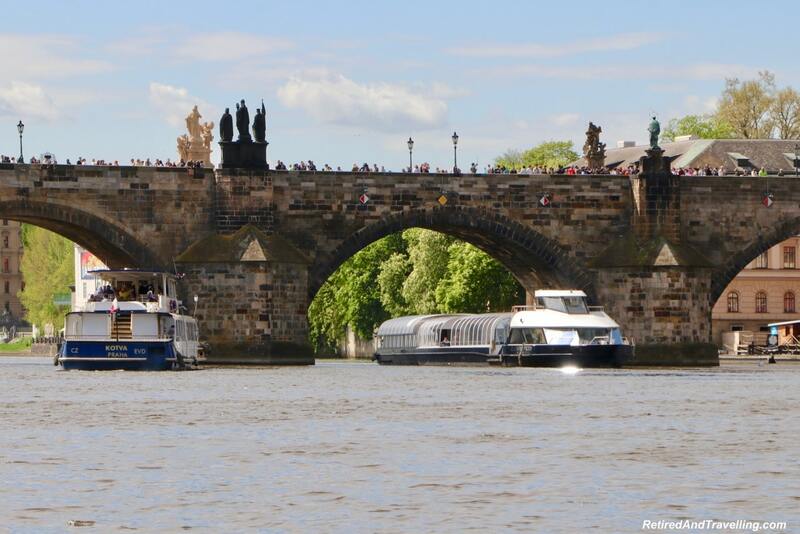 Today it is a pedestrian bridge so the only option is to walk the Charles Bridge in Prague. Along the bridge we found several different stalls selling stuff. Local artisans were reluctant to have us take pictures. But we could have gotten a caricature done of the two of us. At one point we found some musicians on the bridge. People were dancing and snapping pics while we watched. Several times we stopped on the bridge to catch the view. 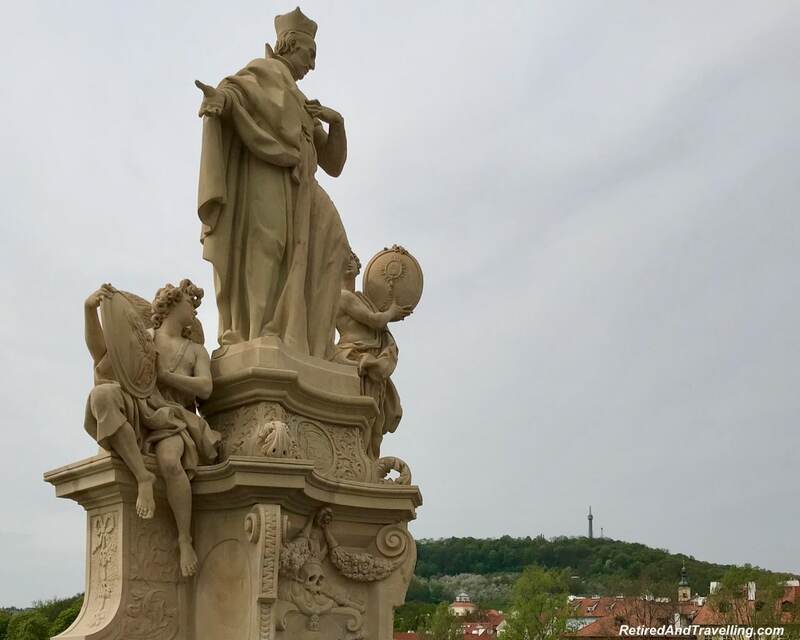 When we looked back, we got a great view of the Prague Castle and St Vitrus Cathedral. 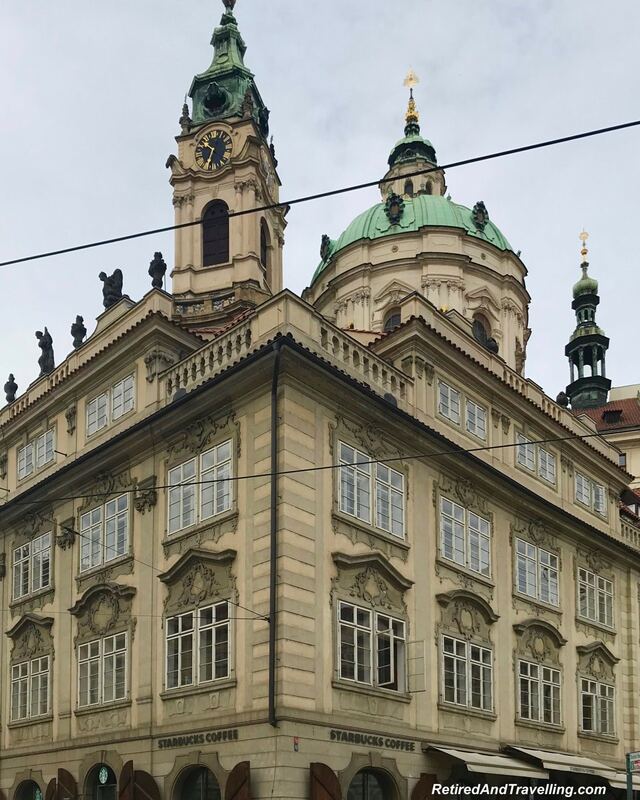 We got such a stunning view of the buildings and architecture of Prague. When we got close to Old Town, we got a glimpse of the interesting skyline. 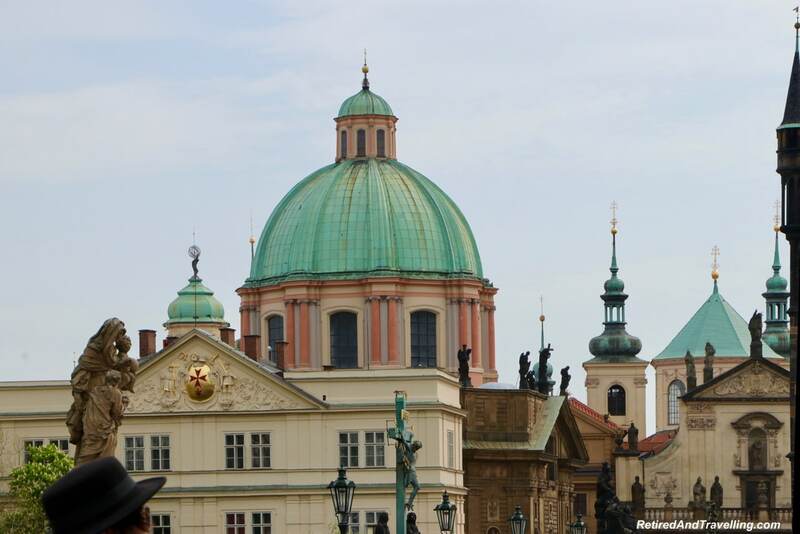 There was such a variety of towers, steeples and ornamentation in the buildings and architecture of Prague. We saw the river tour boats that moved along the river. 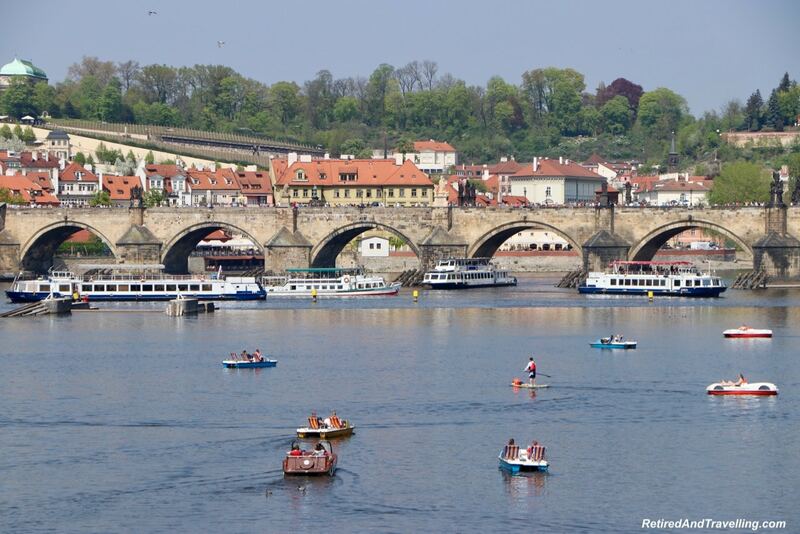 When we took a river cruise in Prague, we would get that trip along the water. We could see the weirs that controlled the water flow of the Vtlava River. And the small set of locks that kept the river navigable. 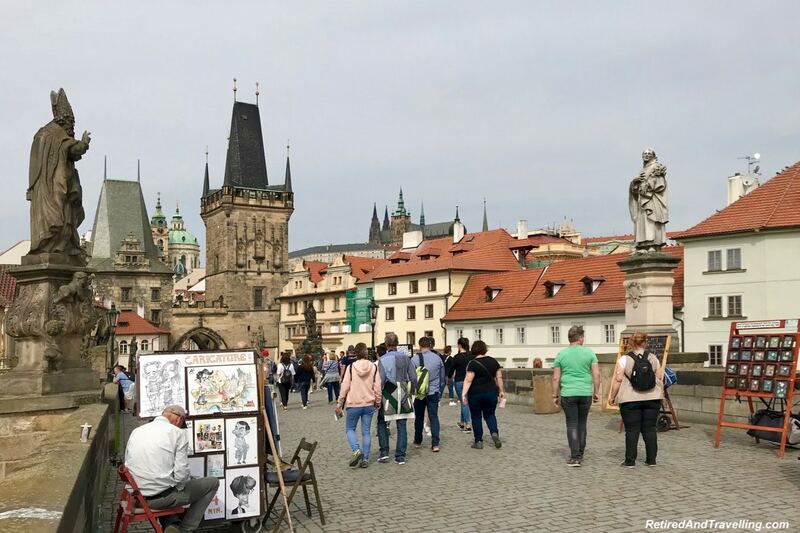 Take time to stroll and look when you walk the Charles Bridge in Prague. There were statues up on the bridge at various points. Most of the statues were totally black in colour. Some had scaffolding and were being renovated. 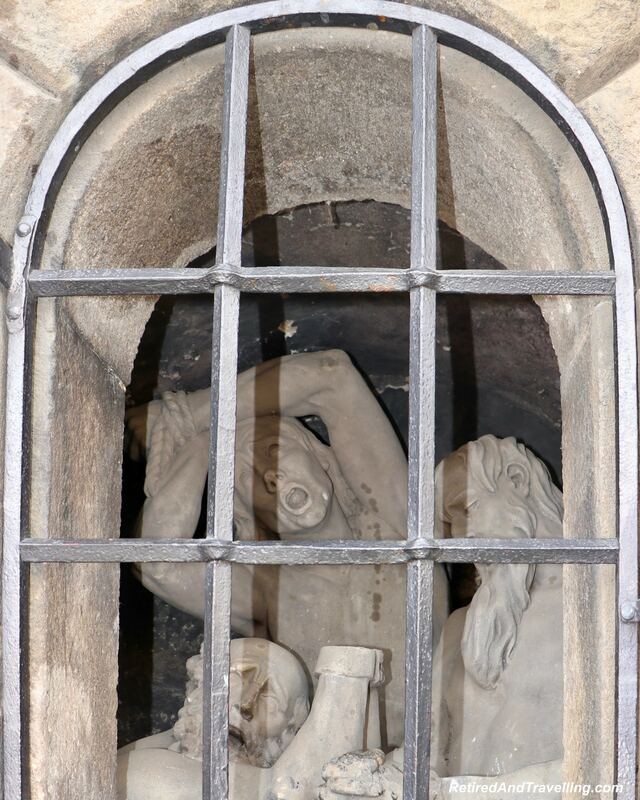 As with many of the buildings in Prague, the statues and bridge gates were made of sandstone. Being a porous material, there were only so many times that the sandstone could be cleaned before it would start to deteriorate. 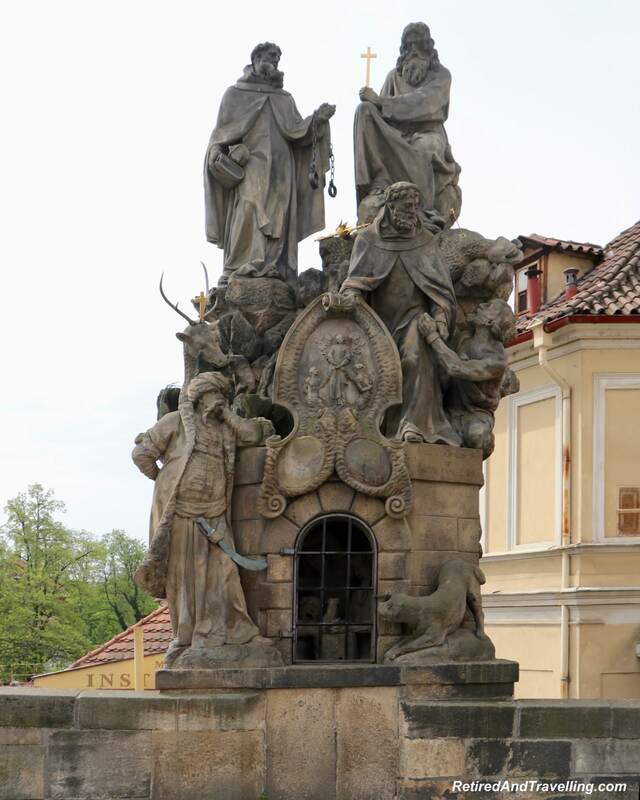 We was a similar bridge with statues when we visited Pisek on our way to stay in Cesky Krumlov. 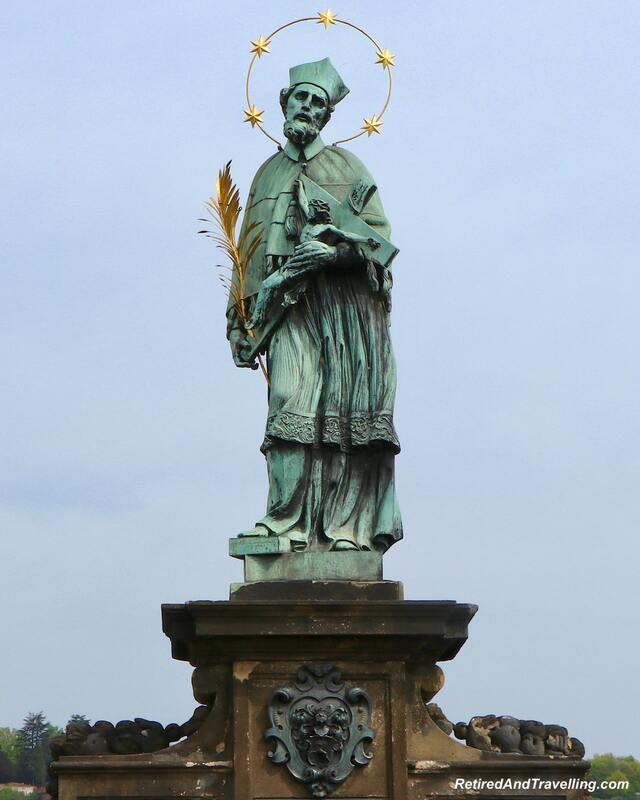 The statues that you see when you walk the Charles Bridge in Prague are all largely religious in nature. It harkens back to a much earlier time in Prague history. Today the country has a very low church going population. We left the Charles Bridge on the other side through the Old Town Tower. We spent some time admiring this gothic tower once we were off the bridge. In the courtyard after the Charles Bridge we saw a statue of King Charles. This is who this bridge was named for. 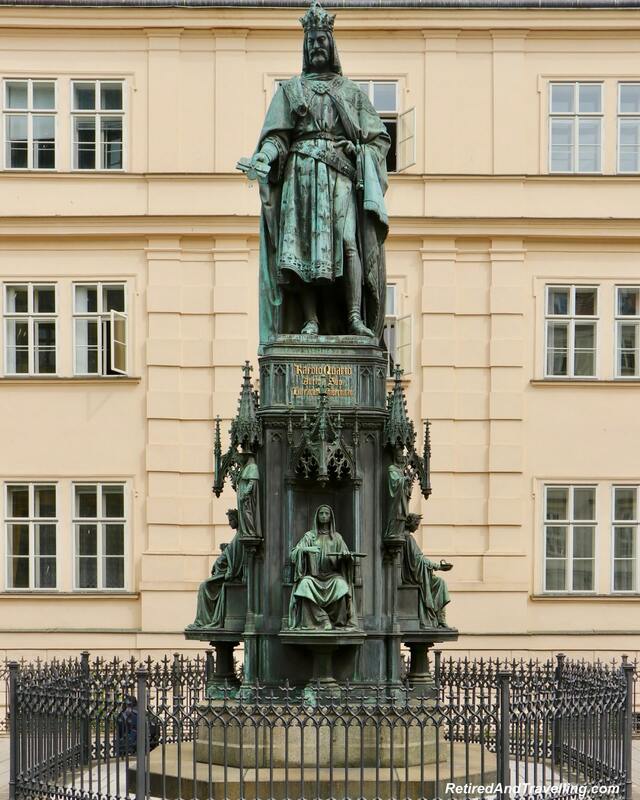 And the person that seems to have a major role in the history of this period of Prague. Right beside the bridge is the small museum. We walked down the stairs to the museum to find the Baroque Coffee Shop. It was an oasis of quiet in a very busy tourist area. 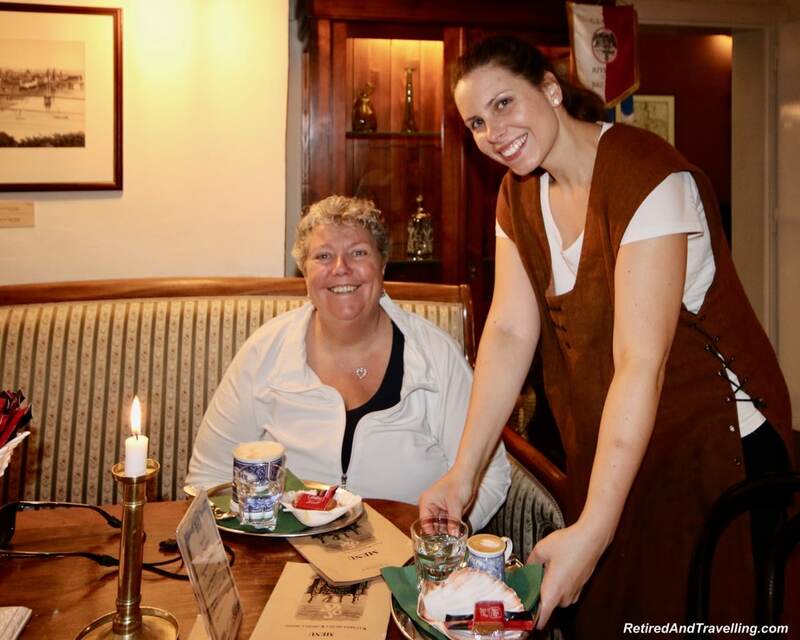 This was just one of the many coffee shops marked on our Prague map. The coffee shop was right beside the entrance we used later in our trip for our Prague River Cruise. 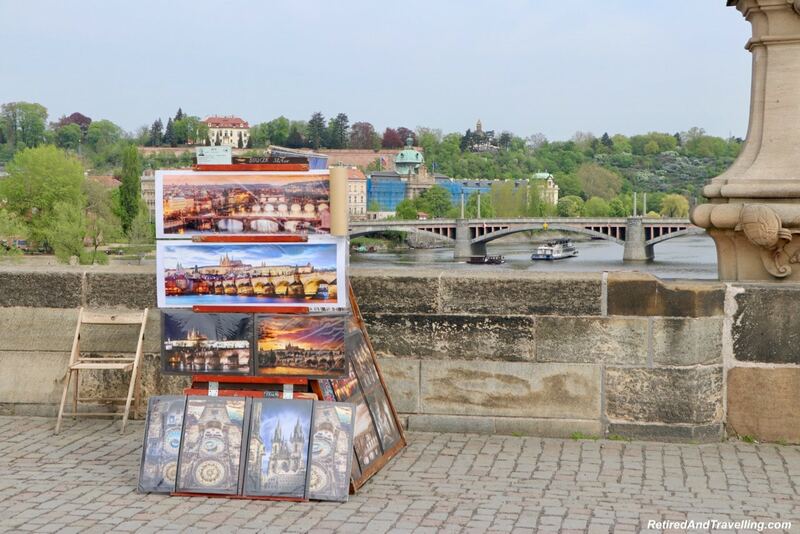 The tourist books all suggest that you walk the Charles Bridge in Prague. 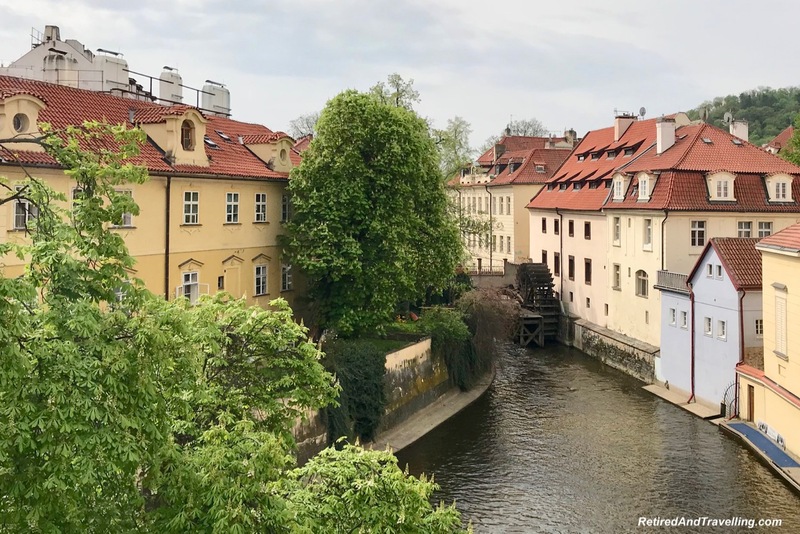 While I figured we would stroll across it on one of our 8 days wandering in Prague, David had it firmly on his “to do” list. When we wandered along the crowded streets to the Lesser Town Tower, I really was not sure where he was leading me. But I was very glad once I saw where he had brought me. The bridge towers were fascinating pieces of gothic architecture. The statues on the bridge were varied and interesting. Artists and musicians on the bridge brought another element. And the Charles Bridge was another great spot for views of the buildings and architecture of Prague. It will give you a bit of a preview of what you might see if you do a river cruise. 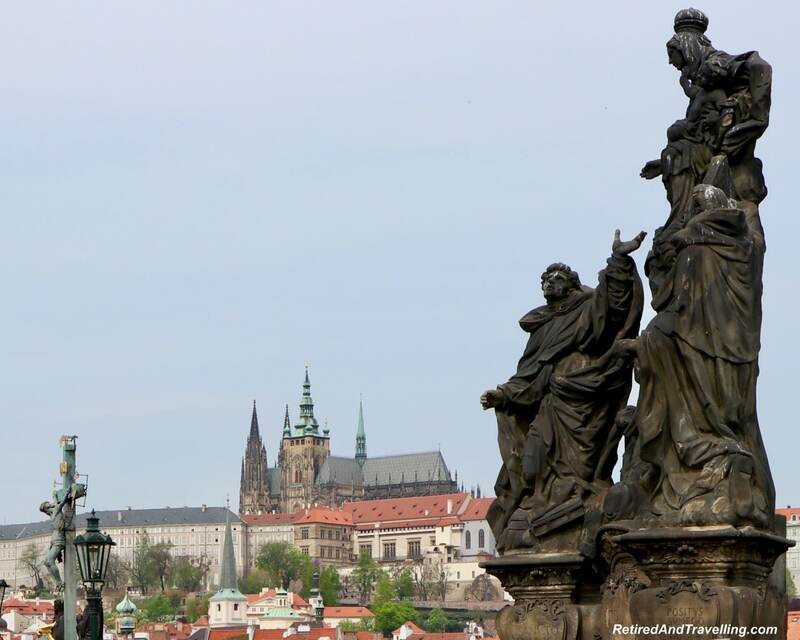 When you visit, make sure to plan some time to walk the Charles Bridge in Prague. There is lots to see end to end. 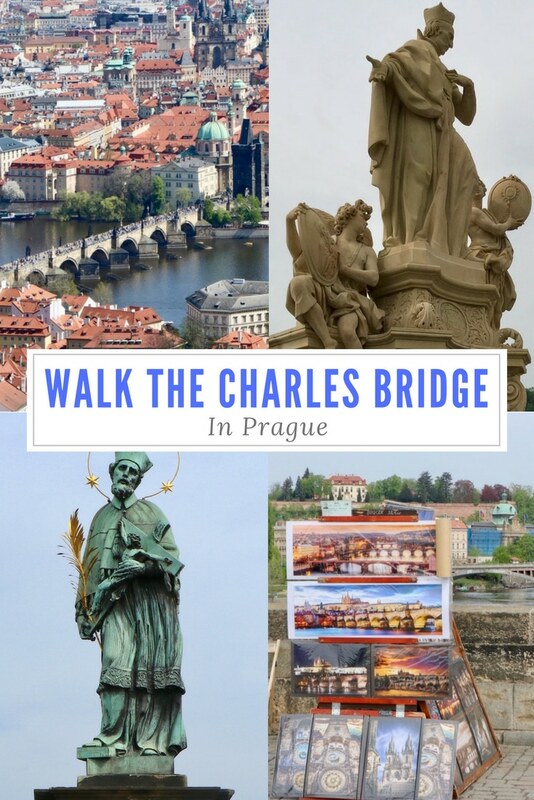 Did you walk the Charles Bridge in Prague? What did you find most fascinating? Beautiful! And I really like how well your photos captured its history and charm. 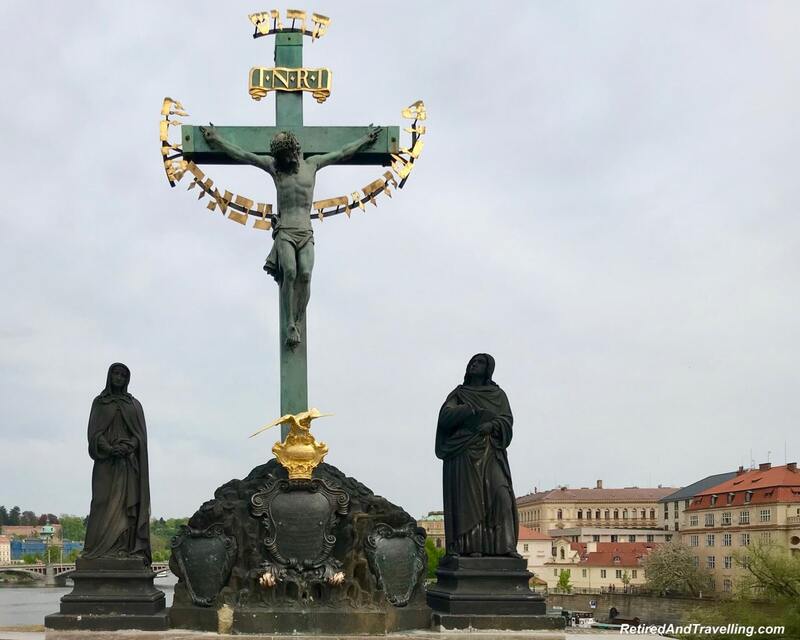 From the statues, architecture, musicians and artists — this looks like a great stop to see in Prague! As always, your photos are just so amazing! You captured the architecture and sculptures beautifully. I will definitely walk the bridge when I finally visit Prague. Hopefully I get to see some dancing! Ohh I love how beautiful Prague is! 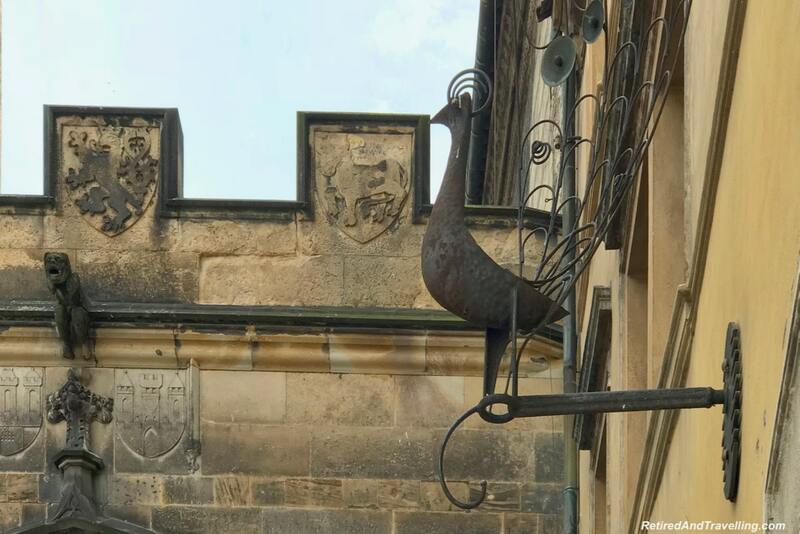 I really love those gorgeous photos of the old town’s perfect architectures. I should really add this to my list and walk by the bridge. Those paintings are also stunning! There all Statues carry the country culture. I love historical place. I never go to this city after I read your post I am interesting to go there. I want some information about this place so easy to travel for me. 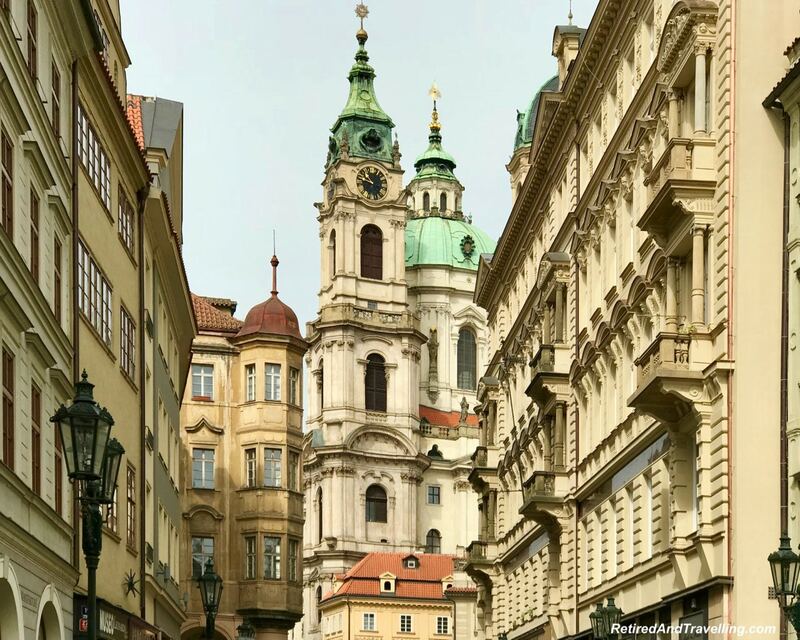 Prague looks like a fairyland with a vintage and old world charm. 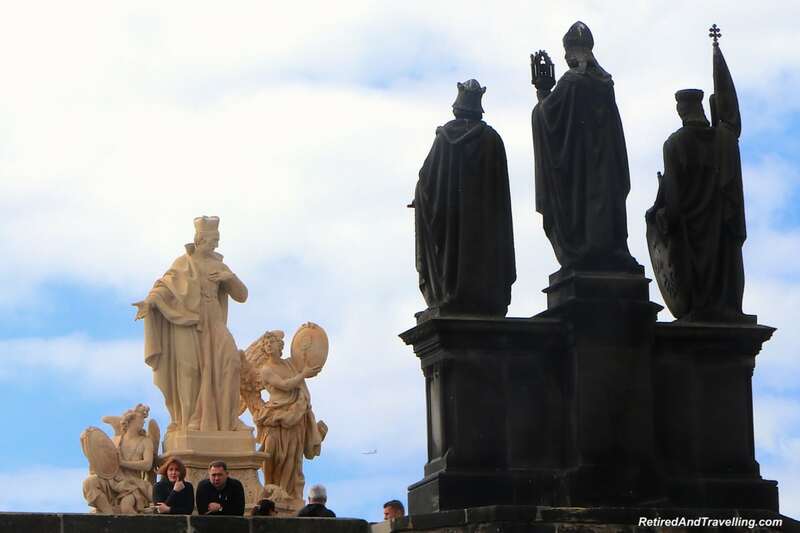 Charles Bridge is indeed an iconic landmark of the place but did not realize that it is much more than just a bridge. It looks like a living museum of art, music, architecture, and sculpture. Love the look of the statues, they look so magnificent. 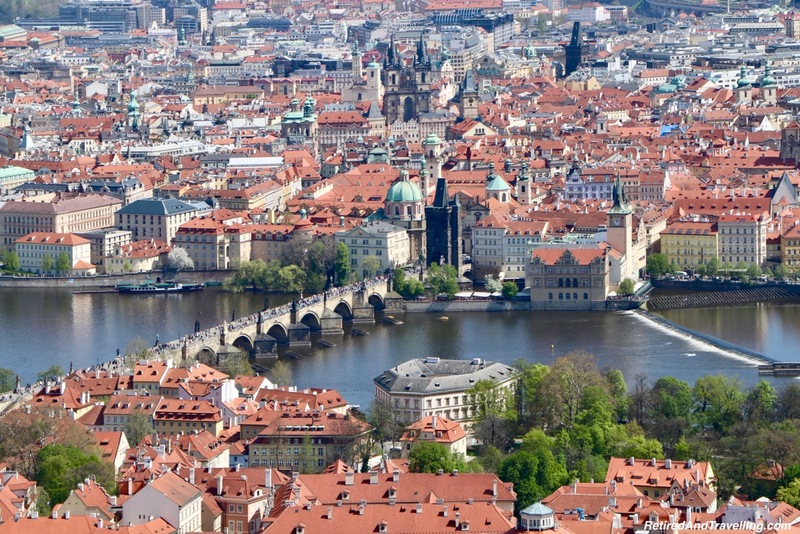 Prague is a place we want to visit and will not miss a chance to take a leisurely walk on the Charles Bridge when we are there. I love the architecture of the churches! I always hear people say that Europe is such a beautiful place and destination and I believe them. Now looking at your photos of Prague I’m again mega convinced! The churches are so charming but surprisingly, there’s a Starbucks at the base of the church? I’m not a big fan of this coffee chain tho. Did you get to have coffee at other coffee shops instead? It’s better, right? I feel like every city has that one iconic thing that you have to see or experience in order to feel like you’ve been there. That’s the Charles bridge in Prague for me. It was the first thing I did when I got there because I seriously could not contain my excitement. I just wish there were less people! Beautifully written and captured post. It was like walking with you again through this iconic bridge. I doubt if this bridge is ever empty. The statues on the sides had special importance. Great pictures. 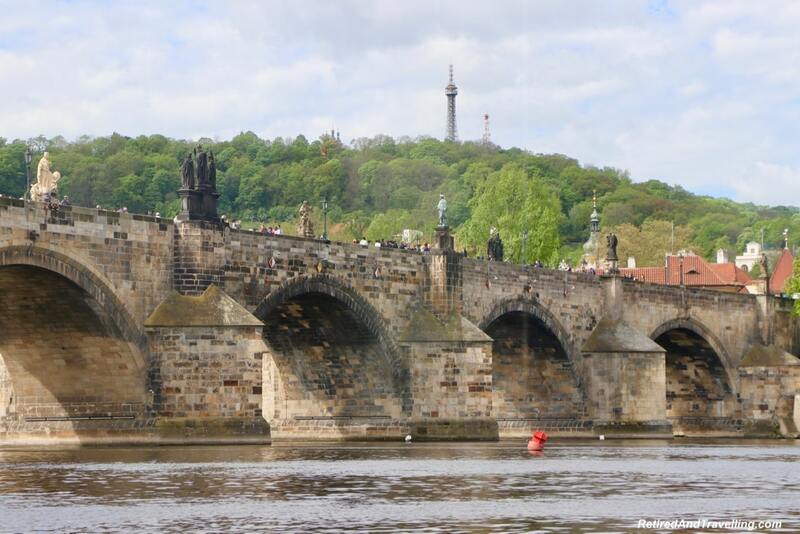 When was the Charles Bridge built? I love how much of the city still looks original. The status are a work of art from another time and place. I am glad so much of the history has survived. 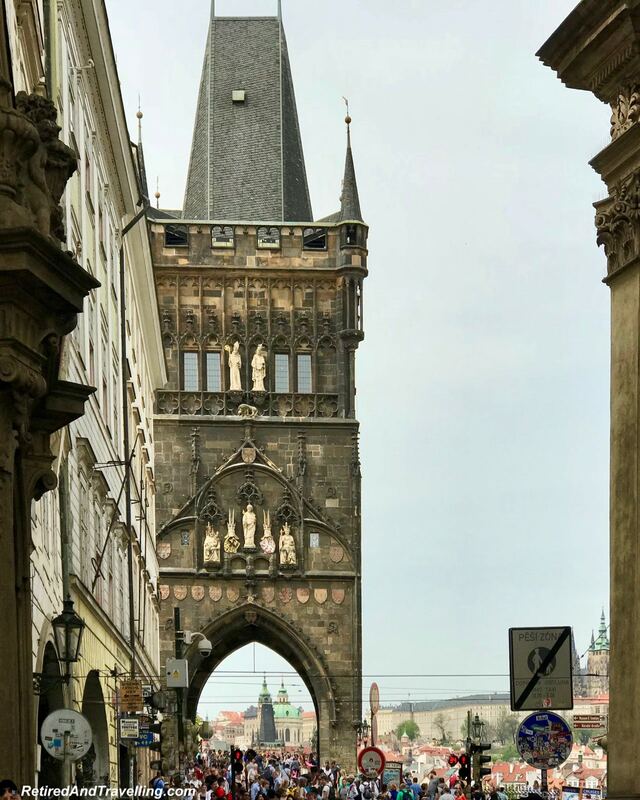 I am a sucker for great architecture and the Charles Bridge in Prague is one of those things I would be photographing from all angles as well! Such great insight on how to see it! Thanks! I hope to have three days there soon and hope to enjoy it from at least half as many angles as you have shown! 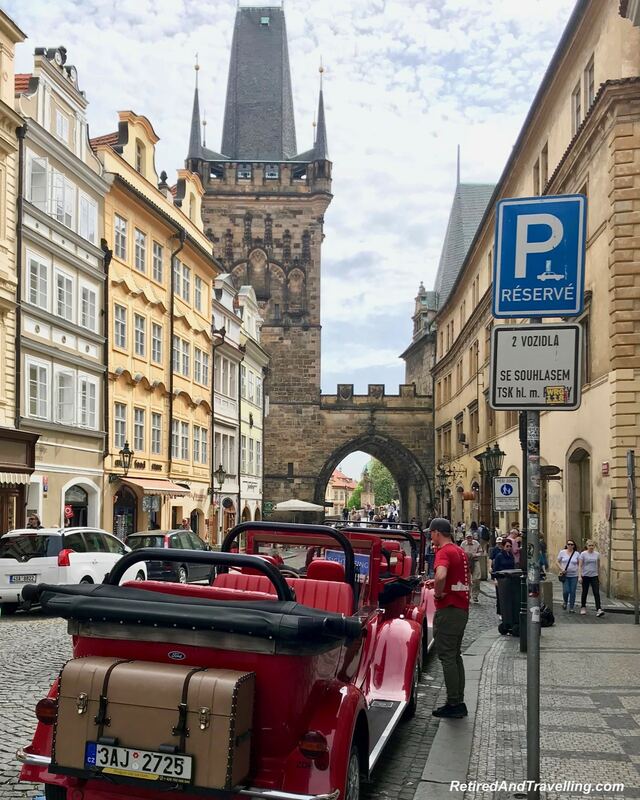 Coming from Canada, we do not have anything like what you can see in Prague! I haven’t been to Prague yet but I’m so curious about it. It looks so lovely! I didn’t realize there was such beautiful architecture to be seen. I’d love to do a river cruise to take it all in. The treats at the coffee shop look yummy as well! 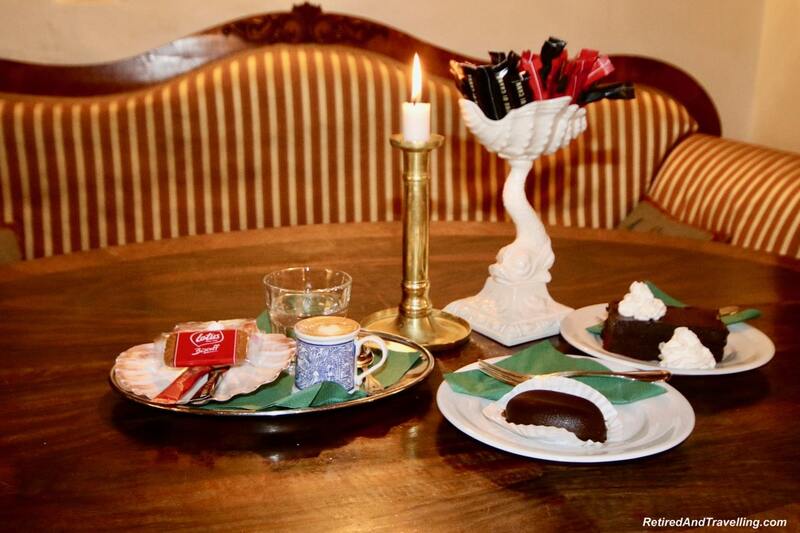 I love a great cafe in Europe. I bet it is great for sunrise or sunset photography as well!